Though it’s been eight years since Canon ended production of its last film SLR, the EOS-1V, the true end of the era was somewhat forestalled as film photographers could still buy one new, if so inclined. Today, that's no longer the case. In a rather casual statement, Canon’s Japanese arm announced that it would no longer be selling the EOS-1V, which was released back in 2000. The EOS-1V was a pro-spec 35mm film camera, the ‘V’ in its name referencing the fact that it was the firm’s fifth generation of professional SLRs. 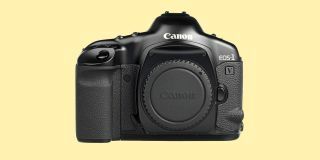 The EOS-1 name classed it as a pro-level camera, a naming convention that Canon continued as it moved from film to digital. Canon has been producing film cameras for just over 80 years, starting out as the Precision Optical Instruments Laboratory in Japan, back in 1937. The first camera that the original engineers produced was called the ‘Kwanon’ – basically a knock-off of popular Leica models at the time. The EOS-1 Flagship Professional SLR line was launched in 1989, a year when digital was already on the horizon. The PowerShot 600 – its first consumer digital camera; not quite the first digital model – made its debut in the 1990s. Though Canon won’t be selling new film cameras any longer, the news comes at a time when Kickstarter campaigns to bring new and revamped versions of older models into production appear to be increasing in frequency, with the Rolleiflex Instant Karma and Reflex 1 being the most recent arrivals to the crowdfunding party. The firm has said it will still be honouring repairs of the camera until 31 October 2025, unless it runs out of parts. You can read the full statement here (though unless you speak Japanese, you’ll need to whack it into Google Translate first).